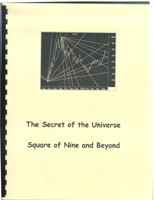 For better insight into when market turns occur and for techniques for timing the buying of stocks and commodities, The Secret of the Universe Collection will get you started using the techniques Gann used to predict the markets. Beautifully typeset Square of Nine with a finely graduated circle. The Cardinal and Fixed Crosses are clearly demarcated by their light gray tone. The square is printed on 24# opaque stock and then laminated in heavy plastic. Draw on the plastic surface with dry erase markers or grease pencils to your hearts content! To help you work through the techniques in the manual, data for both stocks and commodities going back several years is included in both ASCII and Metastock format. The commodity data covers most contracts over a ten year period. The stock data covers S&P 500 stocks going back even more years. You also get daily data for the Dow Jones Industrial Average going all the way back to 1929! Also included on the CD is ephemeris data for the 20th century and through the end of this decade (approx. 2010). 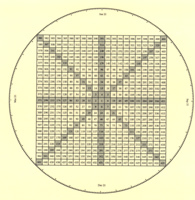 In addition to standard ephemeris data format, a special data format is included in both ASCII and Metastock format that makes it easy to plot planetary cycles on your price charts.